Today I bring you another indie title from an author that I met at RETCon Chicago: Caleb Thusat. Indie comics producer and film maker, Caleb was one of the only creators at RETCon to actually stop me and ask if I wanted to check out his book. A word to creators at booths: engage your prospective fans! 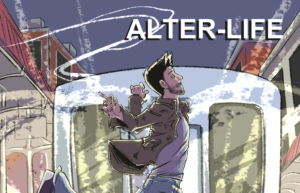 I would not have stopped at Caleb’s booth if he didn’t stop me, but he did, and his pitch was good enough for me to pick up the first two issues of Alter-Life. The rating comes as a result of the adult language in the book. Is it excessive? That’s for you to decide. I’m not sure if it’s all necessary, but I always come at comics from a teacher’s perspective, so I always think the language can be toned down…for the most part. While this book is not without its flaws, I do think that it’s a solid effort on the part of the creative team of Thusat and Kunstmann. The story is interesting, dropping us in with main character, Jake, as he attempts to understand why he can’t die, and why, when he comes back to life, things are slightly different than when he left, but only slightly. We also quickly discover that Jake was at the wheel of his car when an accident killed his wife and child. The entire story is told in dream-like sequences that constantly leave Jake and reader wondering what’s going on. Oh, and there’s also this faceless guy (woman?) that has an interest is Jake as well. Am I notably confused? Yes. Do I want to read issue three? Yes. I have not figured out what’s going on here, but the mystery that Thusat creates is intriguing. This team could have a bright future. I have read the first two. Issue three is currently on Kickstarter, and you can find the link here. If you are interested in picking up issues one and two, reach out to Caleb and ask how you can do that. The Kickstarter bundles have the older issues included. Thanks for the review Eric! Glad we have you hooked. People can pick up issues 1 and 2 at villagecomicbooks.com. 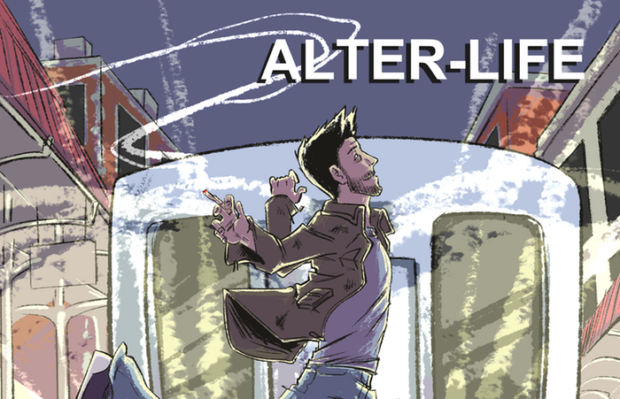 Issue 1 is also on Comixology with issue 2 coming soon! Keep your eyes on my website, the issue 4 Kickstarter is coming in October!